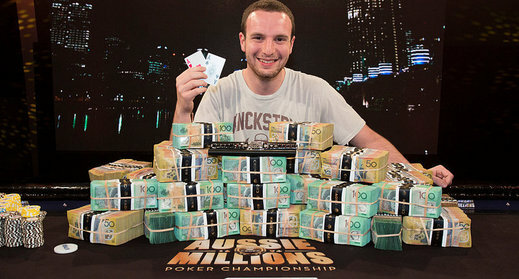 Ami Barer fought off Sorel Mizzi and Jacob Balsiger to take home the 2014 Aussie Millions Main Event. Barer takes back to Canada a cool $1.6m AUD. He is now all the way up to 3rd place in the Player of the Year standings. Barer had opened from the button and Mizzi had moved all-in over the top and Barer snap called with the A A . Mizzi held the Q 8 and would need some help if he wanted to mount a comeback. The board ran out K 2 2 3 A however, giving Barer aces-full to secure the pot and the title of 2014 Aussie Millions main event champion. Here are the final table results along with Player of the Year points earned.